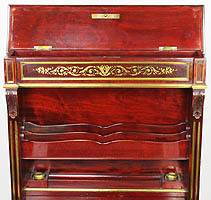 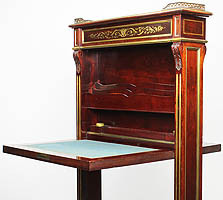 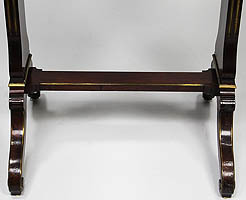 A Fine and Rare French 19th Century Louis XIV Style Mahogany and Brass Inlaid Drop-Front Free-Standing Secretary Desk in the manner of André-Charles Boulle. 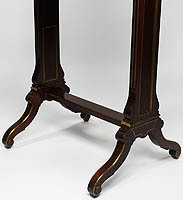 The slender mahogany body centered with a finely chased gilt-brass inlaid floral and allegorical shield, the drop-front top with its original felt writing area, paper storage slots and glass inkwells. 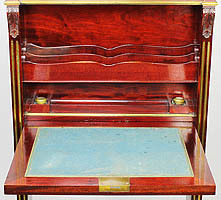 The top with a gilt-bronze gallery and open compartment. 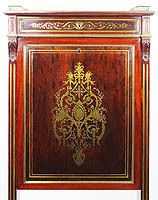 Circa: Paris, 1890.